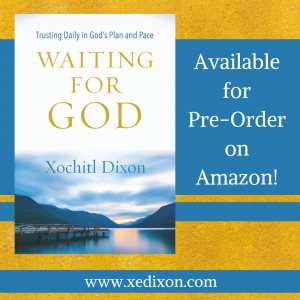 This entry was posted in Writer's Journey and tagged Healing Journey, Published Works, Trusting God, Waiting for God by Xochi E. Dixon. Bookmark the permalink. Thanks for your encouragement, Linda. I look forward to growing with you as we continue to seek Him, surrender to Him, and write to worship Him, Sister. Lynda, I thank God for brining you into my life. Thanks for being such a radiant light of hope and encouragement. I love you and am praying for you. I look forward to growing with you as we continue trusting daily in God’s plan and pace, knowing His perfect love will always be enough to carry us through. Hallelujah! Thanks for your encouragement, LaShondia. I am looking forward to sharing this adventure with you, Sister. May God be glorified in and through our lives, as we wait with great expectations. Hallelujah! I look forward, with great anticipation, to the arrival of 5 of your new devotional books. Thanks for inviting me to this pre-order party. I know it will be just what several of my friends and family and I need! Thank you for your encouragement and prayers as life continues to throw curve balls during the baseball season of my life. God is in control and He knows our needs! My continued prayer is that you are feeling better and have found new Doctors who can provide the care you need in your new area of the United States. Thank you, my Friend and Sister in Christ. Jana, I thank God for your prayers and encouragement. 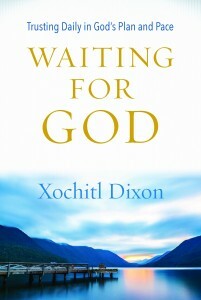 I’m so excited that you will be joining me on this journey as we go through Waiting for God. Lord Almighty, thanks for bringing Jana into my life. Please help us lean on You during the “baseball seasons” of our lives. Be our strength, our hope, and our peace as we rely on Your sovereign goodness. Thanks for assuring us that we can count on Your unchanging character and Your infallible Word, that we can count on You to remain the same . . . even when everything around us feels like a whirlwind of unknowns. We love You, Lord. Please help us trust You. In Jesus’s name Amen. — Yes, Sister. He is in control. He knows our needs. What a gift it is to be on this adventure with others who are trusting God one day . . . and often one breath at a time. You make a difference in my life, sweet sister. To God be the glory, the honor, and the praise!